Who's bad? This young rapper is now causing all the rage among rap music fans. In such a short span of time, he has managed to hit stellar status and is now one of the most in-demand rappers around. Joey Bada$$ is now a name synonymous to knockout hit tracks and a throng of homies who regard him as one of today's rap heroes. 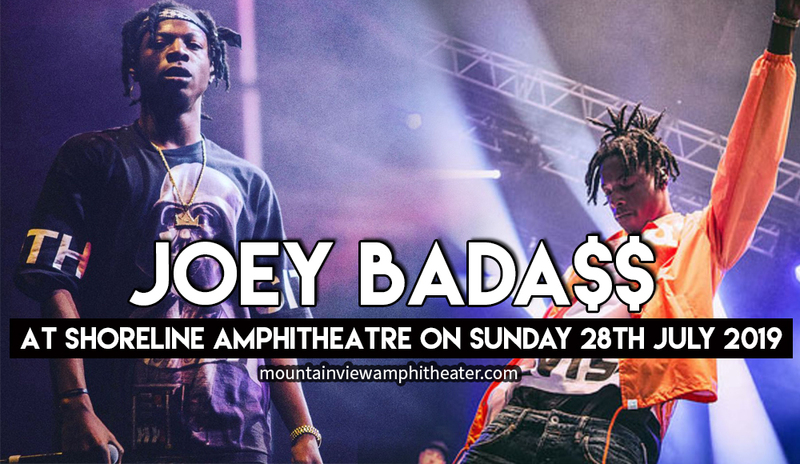 Joey Bada$$ is now on the concert trek and he is stage bound for a one-night-only performance at the Shoreline Amphitheatre on Sunday 28th July 2019. Lock-down tickets to this show before it runs out. This is a fast-seller, a hot ticket that everyone wants a piece of. Hurry, book your tickets now! YouTube has become one of today's strongest platforms for music and artist discovery. When Joey Bada$$ started uploading his freestyling videos on YouTube, it caught the attention American hip hop site World Star Hip Hop. They reposted the video which triggered an avalanche of viewers, which eventually became followers from the hip hop community. With his newfound fame and the degree of influence he has managed to gain, he became co-founder of the hip-hop collective Pro Era, with whom he released three mixtapes. His debut solo mixtape, named, "1999" was released afterwards, plus a video for one of the songs on the mixtape, "Waves". He followed it up with a released that featured hip hop artist Ab-Soul titled "Enter the Void" along with "Waves". These songs became his first official releases to the retail market. Joey Bada$$ is a big crowd drawer. Book your seat a.s.a.p. !